The opening of new airports have typically been recorded by the creation of philatelic covers. The use of Scout commemorative stamp issues increases their interest to Scouts on Stamps collectors. Two commemorative stamps on cover were often used to meet the air mail postage rate. As airmail and airport construction has happened longer than United States Scout stamp issues, it might be possible to find examples of each stamp in such a use. 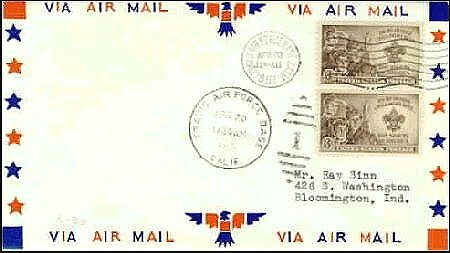 This cover honors the dedication of Travis Air Force Base, CA. located in Solano County. The postmark is dated 1951/04/20.